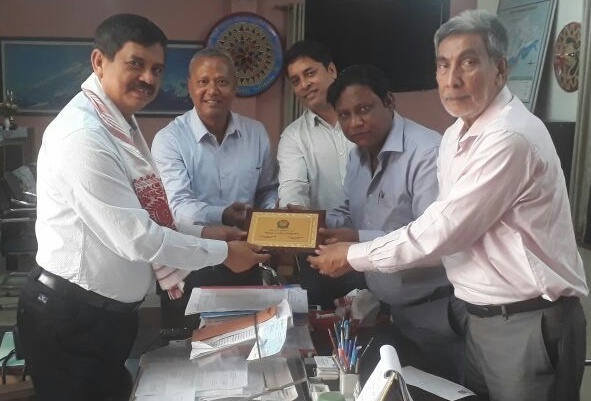 India Club of Guwahati, a pioneer social organization of the State of Assam on Thursday has donated a sum of Rs two lakhs to the benevolent fund initiated by the Deputy Commissioner of Darrang, Ashok Kr Barman with logistic support from different voluntary organizations and individuals. The fund is for the initiatives taken by the Deputy Commissioner in the district of Darrang including, mass plantation drive called ‘Green Darrang’, rehabilitation of widows involved in illegal sale of illicit country liquors , reviving of sick projects of livestock production for rural livelihood and the likes. The fund was donated by the leading non-government organization to carry forward his mission in near future. The president and secretary of India Club, Guwahati, Sankar Dutta Lahkar and Anupam Choudhury respectively accompanied by Kalyan Sahu and Binod Das on Thursday met Deputy Commissioner, Darrang at his office chamber and handed over a cheque of the said amount and also greeted him with a gamosa and a memento for his pro-people innovative actions. The Deputy Commissioner in response expressed gratitude for the generosity shown by the social organization.